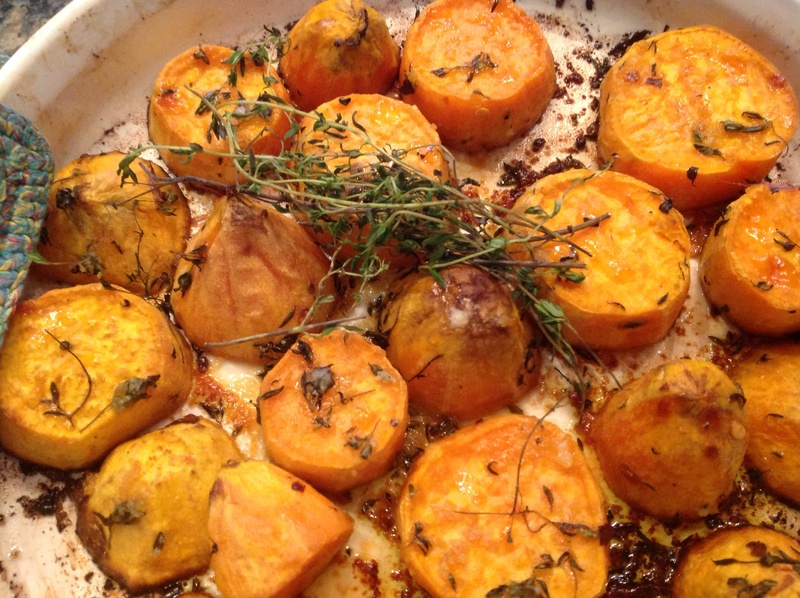 When visiting my Greek best friend, Panorea, in Toronto last fall, she made these roasted sweet potato rounds. They were the hit of the meal. I had never thought to slice sweet potatoes into rounds for roasting and seasoning them with garlic, hot pepper and thyme. This dish was a revelation. The spices in the rub make the house smell so good, your mouth will be watering by the time they are ready! It took a Greek cook to teach this French cook how to really bring out the best in sweet potatoes! You may never want to eat sweet potatoes any other way again. Thanks, Penny! 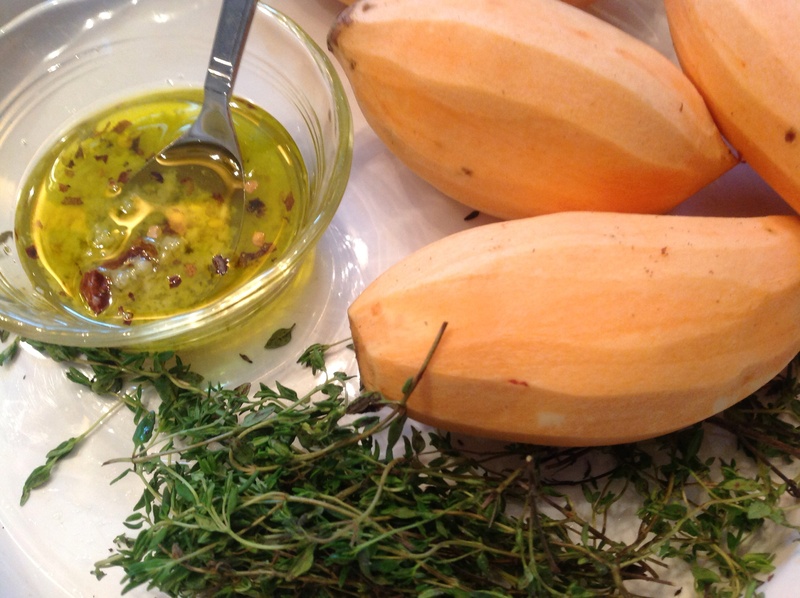 In a medium bowl, mix the oil and seasonings. Toss potato slices to coat. Place the potato rounds in a shallow baking dish and bake at 400F for 45 minutes, turning once. Enjoy as a side. Leftovers are great in a salad the next day. 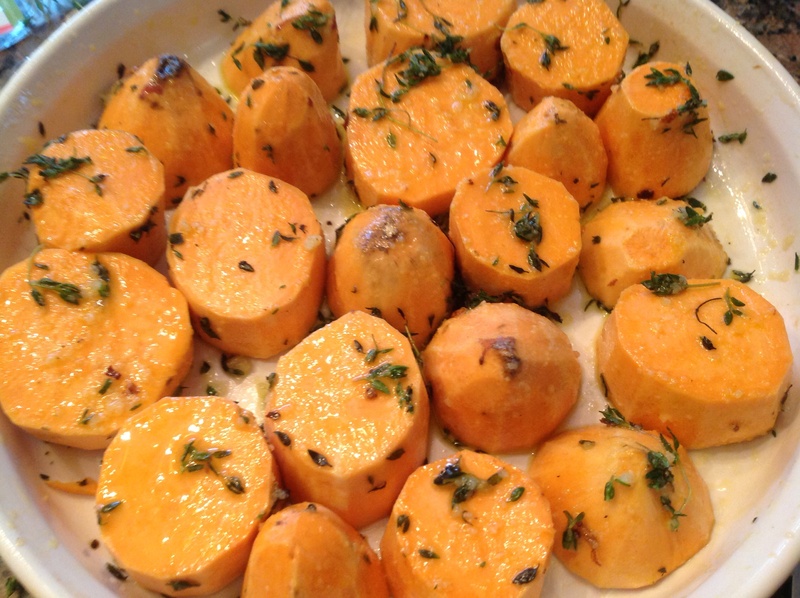 This entry was posted in Recipes and tagged garlicky sweet potatoes, oven roasted sweet potatoes, Side dish, Thanksgiving, Thanksgiving side by Johanne Lamarche. Bookmark the permalink. some renderred bacon fat made it really kicking!!! those colors!! great and delicious I think 🙂 I’m following! I just saw you are from Brazil! I have been researching the work of one of your most famous painters, Romero Britto, all day today for a presentation. Do you know his work? He lives in Miami now but his work is so colorful and happy! I love it. haha finally :P! Thanks! I have had my braces for almost 1 year and a half already. I used fresh thyme from my herb garden this evening, I wondered aloud just what the best way is to get thyme leaves off the stems without getting stems in the food? Do you have a method? Funny another reader in Indonesia suggested bacon fat too! 100% go ahead and be bad, Alycia! Getting thyme leaves off the stem is a pain… I just run my fingers down the stem while holding it with my other hand. This usually leaves the top cluster of thyme leaves on the stem and you can then just pinch those off. This works best with straight, longer stems of the herb. Recently mine seems to be branching into many shorter stems and it is less effective to get those off! $£¥’!!! Until I tired these potatoes at my friend’s I usually did them sweet with maple syrup or with cumin-sea salt-lime juice. These are really great and unexpected. Thanks for reading Alycia.